The movie Real Steel gave us a glimpse of what the future of combat will probably be like. And thanks to TakaraTomy, mankind is taking its first very tiny steps toward that future with these mechanized toy combatants that mirror your jabs and punches. 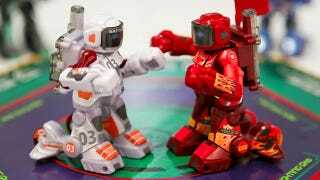 Think of them as a modern take on Rock'em Sock'em Robots that instead use a set of Wii-like wireless controllers. So to get your bot to throw a punch and move about, you first have to do the same. The BattroBorgs—which doesn't quite roll off the tongue—automatically register blows to the head too, incapacitating a bot when it's received too many hits to the noggin'. Up to 20 BattroBorgs can go at it at once for a total free-for-all battle, and the rechargeable battery is good for about 10 minutes of brawling after a 20 minute charge from one of the controllers. They'll be hitting Japan come July 14th for about $48, and will actually be eventually coming to the U.S. and Europe at some point. Exact dates haven't been nailed down, but you can probably assume they'll be targeting the holiday season.